Our Enchanted Kingdom A Stranger’s Venom Walkthrough is loaded with easy instructions and brilliantly colored illustrations to help you solve this challenging hidden objects adventure! 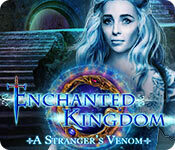 Our Enchanted Kingdom A Stranger’s Venom Collector's Edition Walkthrough is loaded with helpful tips and information to guide you through this intriguing and dramatic hidden object adventure. Look to our vibrant screen shots and easy instructions to solve the challenging mini games and puzzling hidden object areas as you attempt to thwart Ambers plans of revenge against Domenico the dance director extraordinaire. Delve deeply into the world of dark magic and dance as you race the clock against evil and attempt to return this dance company to its former glory. We hope you enjoy our Enchanted Kingdom A Stranger’s Venom Collector's Edition Walkthrough.